"Look! Up in the sky! It's a bird! It's a plane! Oh, it's the yoga pants and batteries I ordered off Amazon being delivered." We're not there yet, but Amazon is working to bring us goods by drone, and a new patent uncovered by CNN shows the online retail giant may employ another bit of aviation tech in its scheme, better known as parachutes. 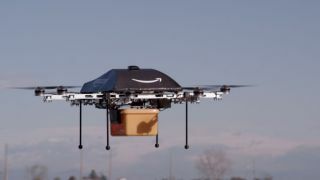 The patent was granted on Tuesday, and according to the CNN report, it outlines a way to safely steer packages after they've absconded from the unmanned aircraft, which in turn wouldn't have to touch down to complete deliveries. Instead of the drone continually landing and taking off from people's yards – a task fraught with the risk of hitting humans, pets, trees, etc – it could release a package while it's flying by employing parachutes, magnets or spring coils, according to the patent. If the package started to veer away from its intended landing zone, the drone, remaining close by to ensure the order arrives at its destination, would send a signal to open parachutes, blast compressed air or unfurl a landing flap to guide the box to the ground. The process seems a bit convoluted, but it does make sense for Amazon drones to stay aloft. It would save time and power if the drone didn't have to land and take off with every delivery, and help eliminate the chance of any drone vs customer unpleasantness. The flip side is that now you have packages falling from the sky, although the parachutes and other measures would – hopefully – prevent Amazon-labeled parcels from crash-landing all over the place. In December, Amazon completed its first Prime Air drone delivery in the UK, and though trials are extremely limited right now, Amazon plans to expand deliveries before long, and possibly to more regions. Despite the progress, though, there are huge obstacles standing in the way of full-blown drone deliveries, including government regulations and safety concerns over flying in populated areas. Amazon seems to be working out the best way to make drone deliveries a reality – and the good news is it's not jumping without a parachute.